Andre had a special ministry to the sick. He would rub the sick person with oil from a lamp in the college chapel, and many were healed. Word of his power spread, and when an epidemic broke out at a nearby college, Andre volunteered to help; no one died. The trickle of sick people to his door became a flood. His superiors were uneasy; diocesan authorities were suspicious; doctors called him a quack. "I do not cure,” he always said; "Saint Joseph cures.” By his death, he was receiving 80,000 letters each year from the sick who sought his prayers and healing. For many years the Holy Cross authorities had tried to buy land on Mount Royal. Brother Andre and others climbed the steep hill and planted medals of Saint Joseph on it, and soon after, the owners yielded, which incident helped the current devotion to Saint Joseph by those looking to buy or sell a home. Andre collected money to build a small chapel and received visitors there, listening to their problems, praying, rubbing them with Saint Joseph's oil, and curing many. The chapel is still in use. Born to a poor but pious rural family, he worked as a shepherd as a child. His family encouraged his vocation to the priesthood, but Charles was a terrible student, barely able to read or write, and had no hope of success in seminary. 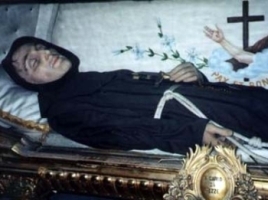 Franciscan lay brother at age 22 at Naziano, Italy. Poor health prevented his going on foreign missions, and he served in assorted menial positions, such as cook, porter, and gardener at friaries near Rome, Italy. 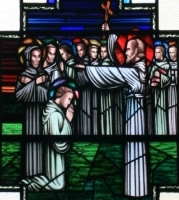 Once a friary superior ordered Charles, as porter, to give food only to traveling friars. When Charles strictly adhered to the rule, alms to the friary decreased. He convinced the superior the two things were related, and Charles was allowed to be more opened handed to travellers; alms to the friars increased. He worked among plague victims in 1656. Charles wrote several mystical works, and at the direction of his confessor, his autobiography, The Grandeurs of the Mercies of God. 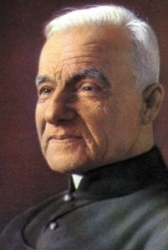 He had a strong devotion to the Eucharist and the Passion. The simple lay brother was sought out for spiritual advice, and the dying Pope Clement IX called Charles to his bedside for a blessing. 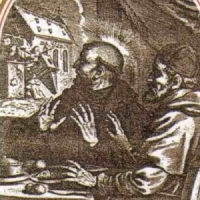 Stigmatist, with a visibly open wound in his side; said to have been opened by a piercing ray of light that came from an elevated host during Mass at the Church of Saint Joseph a Capo le Case. The area of the wound was marked with a cross after his death. Daughter of Manuel Lopes and Josefa de Jesus Almeida. Hers was a pious family, reading and praying the rosary together every evening. She grew up in a time when Portugese Freemasons, with government support, were in open conflict with the Church. Churches and property were seized, religious houses closed, clergy attacked, and religious orders forbidden to accept new members. Rita felt a call to religious life and missionary work, but the suppression of the Church limited her chances; she was able to spend some time with some Benedictine Sisters at Viseu City, who taught her a lot about their way of life. Instead of travelling to the foreign missions, she began travelling from parish to parish, praying, teaching the rosary, and encouraging ordinary people to make the Church a key part of their life. Many returned to the faith and supported her, several young men proposed to her (which she rejected), and many other people opposed her, some threatening to kill her. She developed a great devotion to the Sacred Heart of Jesus, and a great desire to save souls. At age 29 she entered the only religious institute still functioning in Portugal, the Sisters of Charity at Oporto, but did not find it fulfilling, and left. She felt a call to care for single mothers and their children, and with the help of a wealthy noble family in her home town, she obtained a house to start the work. On 24 September 1880 she founded the Sisters of Jesus, Mary and Joseph to help with this ministry. She started a school for poor children in her parish and soon opened several more across the country, staffed by the Sisters. Local authorities, hostile to Church, opposed the schools, and in some cases demanded that they close. In 1910 rebels drove out the monarchy, established a republic, and began a concerted persecution of the Church. All Church property was confiscated, all foreign religious houses left the country, and parochial schools were closed. Rita, some of her sisters, and some of the children in their care disguised themselves as gypsies, and moved back with her parents for safety. Her old home became her new base of operations; she gathered her scattered sisters, and taught local children in the house. In a move that kept the Sisters going, nearly all of them went to Brazil to teach the poor and spread the faith. Rita's health was too poor for her to travel, but she had finally become involved in missionary work, and died with the knowledge that her sisters were doing good. 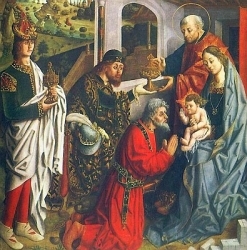 The Three Magi who brought gifts to the Infant Jesus. Daughter of the mayor of Pedro Abad, Spain. Her father died when Raphaela was four years old. She and her sister Dolores (Pilar) joined the Sisters of Marie Reparatrice in Cordova, Spain in 1873. When Bishop Ceferino Gonzalez asked the community to leave his diocese, Raphaela and 15 novices stayed to form a new community. When they were ready to take their vows in 1877, Bishop Gonzalez presented them with a new rule; instead of taking vows, they left Cordova for Madrid, Spain. Raphaela and Dolores finally made their vows in 1877, forming the basis for the Handmaids of the Sacred Heart, a congregation devoted to teaching children and helping at retreats. The congregation received papal approval in 1877. Raphaela served as the congregation's mother general, and the sisters soon had houses throughout Spain, and began to spread abroad. Mother Raphaela resigned in 1893, spending her remaining 32 years in quiet prayer at her congregation's house in Rome, Italy. Carmelite at age 21. Noted preacher and homilist. Order's procurator-general to the papal court at Avignon, France in 1345; while there, he entered the papal diplomatic service. Papal legate to Genoa, Milan, and Venice in Italy. Bishop of Patti, Italy and Lipari, Italy in 1354. Bishop of Coron in 1359. Papal representative to the Eastern Churches, working for peace, unity, and healing of the Great Schism. Papal legate to the East in 1359. Archbishop of Candia, Crete in 1363. Latin Patriarch of Constantinople in 1364. Preached Crusade against the Turks throughout Serbia, Hungary, and Constantinople, and travelled with the armies. Enjoyed a reputation among both Catholic and Orthodox spheres as an apostle of Church unity. 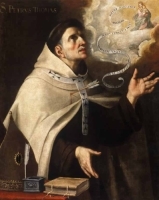 Following a wild and misspent youth, Andrew became a Carmelite at Florence, Italy in 1318. Studied at Paris and Avignon, France. Prior. Provincial of Tuscany, Italy in 1348. Bishop of Fiesole, Italy on 13 October 1349. Had the gifts of prophecy and miracles. Noted peacemaker between quarreling Italian houses. Born to a poor family, and when she was old enough Gertrude began to work as a servant to a rich family in Delft, Netherlands. She was engaged, but was jilted by her betrothed. Joined the Beguine convent at Delft. Received the stigmata and the gift of prophesy. The surname van Oosten is thought to have been a nickname given her due to her frequent repitition of the hymn Het daghet in den Oosten (The Day Breaks in the East). Benedictine monk. Prior of the Scots Monastery Saint Jacob in Regensburg, Germany c.1138. First abbot of the Scots Monastery Saint Jakob in Würzburg, Germany, c.1139, and helped found a hospital there to serve pilgrims. Known for his good works, his simple ascetic life, and as a miracle worker. Son of Peter de Ribera, a devout Christian who was also the Duke of Alcala, Spain, and viceroy of Naples, Italy. Educated at the University of Salamanca. Ordained in 1557. Professor of theology at the University of Salamanca. Highly regarded by Pope Pius V and King Philip II of Spain. Reluctant bishop of Badajoz, Spain on 27 May 1562. Reluctant archbishop of Valencia, Spain on 3 December 1568, serving for over 40 years. Ordered the deportation of all Moors from his see in 1609. Made viceroy of Valencia by King Philip III. Founded the College of Corpus Christi at Valencia. Friend of Saint Nicholas Factor, and his testimony was used in Nicholas' beatification investigation. Lived in private vows of chastity and charity in Rheims, France. Tortured, mutilated and executed for her faith during the persecutions of governor Rictiovarius. Martyr. Consecrated to God as a small child at the abbey of Hirschau, Germany. Educated by and professed as a Benedictine monk at the abbey. Abbot in Lorsch, Germany in 1110. Fearing his appointment had been bought, he resigned and returned to Hirschau. First prior of Prüfening Abbey near Regensburg, Germany in 1114; he became its abbot in 1117. Killed by a lay-brother of the community for what the killer saw as excessive strictness. Mistakenly described on some lists as a martyr. Benedictine monk at Saint Andrew's monastery in Rome, Italy. Chosen by Pope Gregory the Great to work with Saint Augustine of Canterbury and others as missionaries to England in 596. First abbot of the monastery of Saint Peter and Paul at Canterbury, England in 602. Died en route to Rome to report on the success of the mission. Educated at the cathedral school at Auxerre, France. Priest. Chaplain and counselor to the court of king Raoul and queen Emma. Archdeacon of Auxerre. Bishop of Auxerre from 933 to 961. Waged an on-going fight with the nobility who tried to confiscate church goods. Built and restored church structures in his diocese, promoted devotion to the saints from the region, wrote hymns. He was a shepherd who tried to lead and help his people instead of commanding them as was often the case of the time. Born to the French nobility; related to Blessed Irmengard. Priest. Dean of Laon, France. Around 1115, Luc retired from worldly things to live as a hermit at Cuissy-et-Geny, France. His reputation of holiness and wisdom attracted would-be students, Count Guntarius founded a monastery there them all. In 1122 the house became part of the Premonstratensians; in 1124 the community officially became an abbey, and Luc served as its first abbot. Hermit. His reputation caused him to be chosen bishop of Geris, Egypt; he was so reluctant to accept that he barricaded his door with stones. When the authorities and people insisted, he began to pray to be relieved to the burden, and died while in prayer. Son of Matilda and Count Geoffrey le Barbu of Verdun, France. In 997 he gave his wealth to the bishop of Verdun and made a pilgrimage to the Holy Lands. When he returned he became a Benedictine monk at Saint Vanne abbey. Friend of Blessed Richard of Saint Vanne. Prior of the monastery of Saint Vedast, Arras, France. Married chastely to Saint Julian. The two converted their home into a hospital which could house up to 1,000; Basilissa cared for sick indigent women in one wing, Julian cared for the men in another. Married chastely to Saint Basillisa. The two converted their home into a hospital which could house up to 1,000; Basilissa cared for sick indigent women in one wing, Julian cared for the men in another. Monk. Spiritual student of Saint Columba. Sixth century Apostolic Delegate to Ireland. Abbot at Connor, Ireland. Bishop of Connor. One of the bishops who received a letter from the Roman Church in 640 about the controversy over Easter dating, and the Pelagian heresy. Hermit the Armonica area of Brittany in modern France. Evangelist in Wales. Legend says that he spent his early life as a friend of King Arthur. Missionary, working in the 4th and 5th century with Saint Germanus of Auxerre in the Champagne region of France. Monk at Landévennec, France. First century bishop of Philadelphia in Asia minor. Soldier. Knight. Mercedarian. Captured by Muslim invaders, he was imprisoned, tortured, and executed for his faith. First Mercedarian martyr. Left his homeland to become a spiritual student of Saint David of Wales. Hermit on Mount Mairge in Ireland. Founded a boy's school in Kilkenny, Ireland. Wife of Duke Berthold of Bavaria. Widowed c.947. Benedictine nun. Founded the convent of Bergen, near Neuburg, Germany, on the Danube c.976. Noted for her skill in the hand crafts. Benedictine nun and then abbess of the Abbey of Traunkirchen, Germany (in modern Austria). Hermitess at Saint Mary's chapel, Huysburg, Halberstadt, Germany c.1070. When the double monastery of Quedlinburg was founded there in 1080, Pia entered as a nun and then became its abbess. 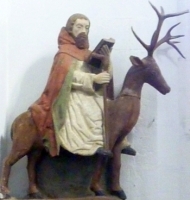 Pilgrim companion of Saint Cadfan. Founded Aberdaron abbey, Gwynedd, Wales. Hermit at Bangor, Wales. Spiritual student of Abbot Dunawd. Titular patron of churches in Wales and Brittany. 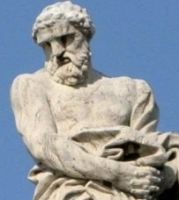 Brother of Saint Samson of York. Spiritual student of Saint Illtyd. Founded a church in Anglesey, Wales. Unknown number of Christian men and women who were martyred in the persecutions of Septimus Severus. A group of Christians martyred together for their faith. The only surviving details are the names of eight of them - Anastasius VIII, Florianus, Florus, Jucundus, Peter, Ratites, Tatia and Tilis.